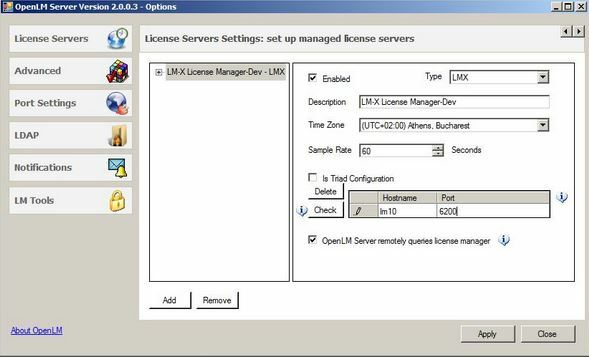 This application note elaborates the steps required to configure OpenLM to interface with LM-X, to monitor license usage and obtain license statistics. Select the LM Tools tab, located on the left side. Copy lmxendutil.exe to “C:\Program Files\OpenLM\OpenLM Server\LM” (32bit) or “C:\Program Files (x86)\OpenLM\OpenLM Server\LM” (64bit).. Copy the full path of the executable file, should be:“C:\Program Files\OpenLM\OpenLM Server\LM\lmxendutil.exe” in the LM-X executable file text box. From the Type drop-down menu,select LM-X. Is Triad Configuration: This configuration is reserved for FlexLM license managers. Keep it unchecked. Click Apply, and then consecutively the Restart now button. The LM-X server is now ready to interface with OpenLM. 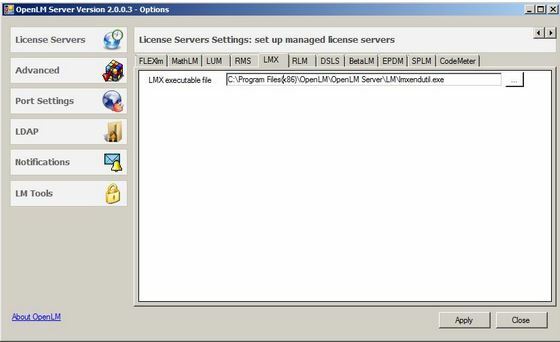 The OpenLM Broker is an optional though highly recommended component, that should be installed and configured on the LM-X license manager machine. It provides accurate license statistics, and facilitates communication between the OpenLM Server and the License manager. Download and install the latest OpenLM Broker version. Follow the installation and configuration instructions on the OpenLM Broker Application Note. Click EasyAdmin Start → Management → License servers. The “License Servers” window appears. Verify that the configured license managers appear on the list. A green circle node indicates an active connection to a license server.